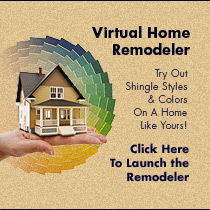 We want to help you find just the right roof for your home. When you hire a roofing contractor, it’s important to look for a team with expertise and personal service. That’s why we work only with full-time employees, never sub-contractors. That’s also why we expect our employees to update their knowledge base frequently. Not only will we meet every industry standard, but we’ll also make the process as smooth as possible. First, we’ll meet you for a roof inspection. After the inspection, we’ll provide you with an estimate. From there, we’ll suggest the best materials to use. We base these choices on the product’s quality and curb appeal. While we do make suggestions, the decision is up to you. Tell us your preferences, and we’ll work from there! After you choose the materials you’d like, we’ll schedule a time to complete the job. Our crew will meet you on-site with all of the materials needed for your project, and we’ll stay until the job is done right. That’s part of our commitment to high-quality service. In order to provide you with the best roof possible, we carry products from multiple manufacturers. We also provide a wide range of roofing services, so no matter what you need, our crews can take care of it. 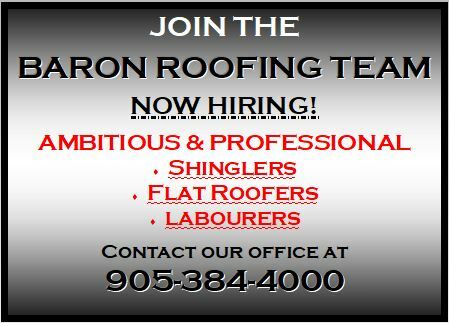 Want to learn more about roofing systems? Click here to view our glossary of popular roofing terms. Considering financing options? Baron Roofing has teamed up with Home Trust to provide you with financing options for your roofing and siding options. Click here to fill out an application. GAF – Baron Roofing & Siding is an authorized installer under the GAF Master Elite Contractor program. As a Master Elite Contractor, we can offer you an extended, 50-year GAF Smart Choice System Plus Ltd. Warranty (non-prorated for material and labour). If you want to know more, ask one of our estimators about the warranty upgrades that we can offer. 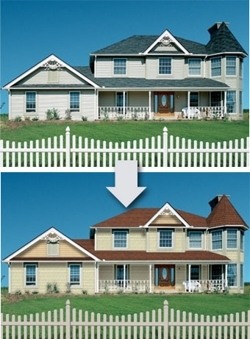 GAF’s roofing products work together for long-term protection. Millions of homes across the country trust their products; they even carry the prestigious Good Housekeeping Seal. To learn more about what makes a superior roofing system, click on any of the categories below. IKO (Shield Pro Plus) – We are a Certified Residential Roof Contractor with IKO. In order to receive IKO certification, we have to set a standard for quality, durability, and innovation. Bakor – Bakor leads the industry in air barrier, waterproofing, and roofing systems and solutions. No other manufacturer can offer you a more diverse list of products for your building’s design requirements. For over 60 years, Bakor has led the way in industrial, commercial, and institutional construction technologies. Now, Bakor takes its expertise to residential construction. Let us help you improve the performance and durability of your house with Bakor products. ColorView – ColorView helps you visualize your home! When you use ColorView, you can create your own custom exterior from CertainTeed’s library of products and colours. Creating your dream home has never been easier! After you find the perfect combination of products, ColorView lets you share your choices with a friend or building professional. From there, you can research specific product information and samples, and get an estimate. VELUX – Baron Roofing & Siding also installs roof windows and skylights according to VELUX standards. As a member of the VELUX Installer program, we provide quality installation that follows manufacturers’ guidelines. Want to learn more about our manufacturers? Click here for additional links and information.